The central retinal artery, a branch of the ophthalmic artery, enters the eye through the optic disc and divides into multiple branches to perfuse the inner layers of the retina. A branch retinal artery occlusion (BRAO) occurs when one of these branches of the arterial supply to the retina becomes occluded. Examples are shown in the images below. Color fundus photo of right eye with inferior branch retinal artery occlusion from a platelet-fibrin embolus. 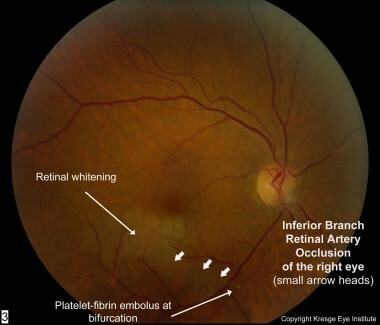 Retinal whitening surrounding the occluded artery is noted. Color fundus photo of right eye with inferior branch retinal artery occlusion. Courtesy of Vanderbilt Eye Institute. Color fundus photo of right eye with superior branch retinal artery occlusion. Courtesy of Vanderbilt Eye Institute. Ischemia of the inner layers of the retina leads to intracellular edema as a result of cellular injury and necrosis. This intracellular edema has the ophthalmoscopic appearance of grayish whitening of the superficial retina. Primate studies have shown that complete occlusion of arterial supply to the retina results in reversible ischemic injury in up to 97 minutes. This may help explain why patients may give a history of transient loss of vision prior to an episode of BRAO. Possibly, these episodes are secondary to emboli transiently becoming lodged, causing temporary occlusions and then reperfusing the retina as the emboli are released. BRAO is most likely to occur at the bifurcation of an artery because bifurcation sites are associated with a narrowed lumen. In 90% of cases, BRAOs involve the temporal retinal vessels. Whether the temporal retinal vessels are affected more often or whether the nasal retinal vessel occlusions are more often undetected is unclear. Patients with BRAO have a higher risk for morbidity and mortality secondary to cardiovascular and cerebrovascular disease. A thorough medical workup is indicated for all patients with BRAO, and an etiology can be identified in as many as 90% of patients. Central retinal artery occlusions (CRAOs) account for 58% of acute retinal artery obstructions, BRAOs account for 38%, and cilioretinal artery occlusions account for 5%. Regarding mortality, one study found a 3-fold higher risk of 8-year mortality from stroke in patients with documented retinal emboli at baseline compared with patients without emboli. A case series reported that 15% of patients with retinal emboli died within 1 year, and a mortality rate of 54% was shown within 7 years. Given the higher incidence of cardiovascular and cerebrovascular complications in these patients, appropriate subspecialist referrals should be made at the time of diagnosis. One study compared retinal artery occlusions in black and white patients and found that both groups have the same risk factors for retinal arterial occlusive disease. This study also suggested that whites were more likely to have identifiable carotid disease than blacks. Among elderly patients, men are 2.5 times more likely than women to have retinal emboli. This correlates with the higher rate of stroke found in men. Typically, BRAO presents in the seventh decade of life. BRAO due to embolic causes is rare in patients younger than 30 years. Less than 1 per 50,000 outpatient visits to the ophthalmologist are estimated to involve a person younger than 30 years with retinal arterial obstruction. These cases are more likely to be nonembolic causes of retinal arterial occlusions. Recovery from BRAO is usually very good without treatment; 80-90% of patients improve to a visual acuity of 20/40 or better. However, some degree of visual field deficit usually persists. Patients should know that this disorder may serve as a warning of more serious systemic diseases, such as cardiovascular disease or stroke. For excellent patient education resources, visit eMedicineHealth's Eye and Vision Center and Cholesterol Center. Also, see eMedicineHealth's patient education articles Anatomy of the Eye, High Cholesterol, and Cholesterol FAQs. Chang M, Herbert WN. Retinal arteriolar occlusions following amniotic fluid embolism. Ophthalmology. 1984 Dec. 91(12):1634-7. [Medline]. Chuang EL, Miller FS 3rd, Kalina RE. Retinal lesions following long bone fractures. Ophthalmology. 1985 Mar. 92(3):370-4. [Medline]. Cohen SM, Davis JL, Gass DM. Branch retinal arterial occlusions in multifocal retinitis with optic nerve edema. Arch Ophthalmol. 1995 Oct. 113(10):1271-6. [Medline]. Fineman MS, Savino PJ, Federman JL, Eagle RC Jr. Branch retinal artery occlusion as the initial sign of giant cell arteritis. Am J Ophthalmol. 1996 Sep. 122(3):428-30. [Medline]. Friberg TR, Gragoudas ES, Regan CD. Talc emboli and macular ischemia in intravenous drug abuse. Arch Ophthalmol. 1979 Jun. 97(6):1089-91. [Medline]. Gass JD, Tiedeman J, Thomas MA. 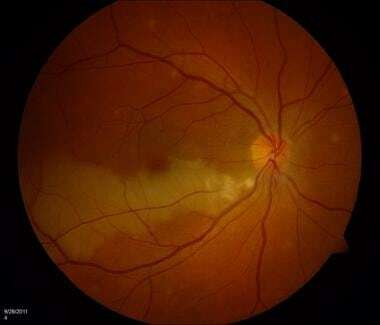 Idiopathic recurrent branch retinal arterial occlusion. Ophthalmology. 1986 Sep. 93(9):1148-57. [Medline]. Greven CM, Weaver RG, Owen J, Slusher MM. Protein S deficiency and bilateral branch retinal artery occlusion. Ophthalmology. 1991 Jan. 98(1):33-4. [Medline]. Johnson MW, Thomley ML, Huang SS, Gass JD. Idiopathic recurrent branch retinal arterial occlusion. Natural history and laboratory evaluation. Ophthalmology. 1994 Mar. 101(3):480-9. [Medline]. Nelson ME, Talbot JF, Preston FE. Recurrent multiple-branch retinal arteriolar occlusions in a patient with protein C deficiency. Graefes Arch Clin Exp Ophthalmol. 1989. 227(5):443-7. [Medline]. Reichel E, Duker JS, Puliafito CA, Hedges TR 3rd, Caplan L. Branch retinal arterial occlusion caused by a preretinal arterial loop. Neurology. 1994 Jun. 44(6):1181-3. [Medline]. Rush JA, Kearns TP, Danielson GK. Cloth-particle retinal emboli from artificial cardiac valves. Am J Ophthalmol. 1980 Jun. 89(6):845-50. [Medline]. Williamson TH, Meyer PA. Branch retinal artery occlusion in toxoplasma retinochoroiditis. Br J Ophthalmol. 1991 Apr. 75(4):253. [Medline]. Yasuma F, Tsuzuki M, Yasuma T. Retinal embolism from left atrial myxoma. Jpn Heart J. 1989 Jul. 30(4):527-32. [Medline]. Zamora RL, Adelberg DA, Berger AS, Huettner P, Kaplan HJ. Branch retinal artery occlusion caused by a mitral valve papillary fibroelastoma. Am J Ophthalmol. 1995 Mar. 119(3):325-9. [Medline]. Chang YS, Chu CC, Weng SF, Chang C, Wang JJ, Jan RL. The risk of acute coronary syndrome after retinal artery occlusion: a population-based cohort study. Br J Ophthalmol. 2015 Feb. 99 (2):227-31. [Medline]. Bruno A, Jones WL, Austin JK, Carter S, Qualls C. Vascular outcome in men with asymptomatic retinal cholesterol emboli. A cohort study. Ann Intern Med. 1995 Feb 15. 122(4):249-53. [Medline]. Chang YS, Jan RL, Weng SF, Wang JJ, Chio CC, Wei FT, et al. Retinal artery occlusion and the 3-year risk of stroke in Taiwan: a nationwide population-based study. Am J Ophthalmol. 2012 Oct. 154 (4):645-652.e1. [Medline]. Mason JO 3rd, Patel SA, Feist RM, Albert MA Jr, Huisingh C, McGwin G Jr, et al. Ocular neovascularization in eyes with a central retinal artery occlusion or a branch retinal artery occlusion. Clin Ophthalmol. 2015. 9:995-1000. [Medline]. Yamamoto K, Tsujikawa A, Hangai M, Fujihara M, Iwawaki T, Kurimoto Y. Neovascular glaucoma after branch retinal artery occlusion. Jpn J Ophthalmol. 2005 Sep-Oct. 49(5):388-90. [Medline]. Ahuja RM, Chaturvedi S, Eliott D, Joshi N, Puklin JE, Abrams GW. Mechanisms of retinal arterial occlusive disease in African American and Caucasian patients. Stroke. 1999 Aug. 30(8):1506-9. [Medline]. Hayreh SS, Zimmerman MB. Amaurosis fugax in ocular vascular occlusive disorders: prevalence and pathogeneses. Retina. 2014 Jan. 34(1):115-22. [Medline]. Biousse V, Nahab F, Newman NJ. Management of Acute Retinal Ischemia: Follow the Guidelines!. Ophthalmology. 2018 Apr 30. [Medline]. Sharma S, Pater JL, Lam M, Cruess AF. Can different types of retinal emboli be reliably differentiated from one another? An inter- and intraobserver agreement study. Can J Ophthalmol. 1998 Apr. 33(3):144-8. [Medline]. Arruga J, Sanders MD. Ophthalmologic findings in 70 patients with evidence of retinal embolism. Ophthalmology. 1982 Dec. 89(12):1336-47. [Medline]. Doubal FN, Hokke PE, Wardlaw JM. Retinal microvascular abnormalities and stroke: a systematic review. J Neurol Neurosurg Psychiatry. 2009 Feb. 80(2):158-65. [Medline]. Aleman TS, Tapino PJ, Brucker AJ. Evidence of recurrent microvascular occlusions associated with acute branch retinal artery occlusion demonstrated with spectral-domain optical coherence tomography. Retina. 2012 Sep. 32(8):1687-8. [Medline]. Ahmed HJ, Klefter ON, Willerslev A, Munch IC, Larsen M. Embolus characterization in branch retinal artery occlusion by optical coherence tomography. Acta Ophthalmol. 2014 Aug 13. [Medline]. Bonini Filho MA, Adhi M, de Carlo TE, Ferrara D, Baumal CR, Witkin AJ, et al. OPTICAL COHERENCE TOMOGRAPHY ANGIOGRAPHY IN RETINAL ARTERY OCCLUSION. Retina. 2015 Nov. 35 (11):2339-46. [Medline]. Bonnin S, Krivosic V, Cognat E, Tadayoni R. Visibility of Blood Flow on Optical Coherence Tomography Angiography in a Case of Branch Retinal Artery Occlusion. J Ophthalmic Vis Res. 2018 Jan-Mar. 13 (1):75-77. [Medline]. Schumacher M, Schmidt D, Jurklies B, Gall C, Wanke I, Schmoor C, et al. Central retinal artery occlusion: local intra-arterial fibrinolysis versus conservative treatment, a multicenter randomized trial. Ophthalmology. 2010 Jul. 117 (7):1367-75.e1. [Medline]. Man V, Hecht I, Talitman M, Hilely A, Midlij M, Burgansky-Eliash Z, et al. Treatment of retinal artery occlusion using transluminal Nd:YAG laser: a systematic review and meta-analysis. Graefes Arch Clin Exp Ophthalmol. 2017 Oct. 255 (10):1869-1877. [Medline]. Brunner S, Binder S. Surgical embolus excision in retinal artery occlusion - two case reports. Acta Ophthalmol. 2013 Dec. 91(8):e652-3. [Medline]. García-Arumí J, Martinez-Castillo V, Boixadera A, Fonollosa A, Corcostegui B. Surgical embolus removal in retinal artery occlusion. Br J Ophthalmol. 2006 Oct. 90(10):1252-5. [Medline]. [Full Text]. Albert DM, Jakobiec FA. Principles and Practice of Ophthalmology. WB Saunders; 1994. Vol. 2: 727-35. Blauth CI, Smith PL, Arnold JV, Jagoe JR, Wootton R, Taylor KM. Influence of oxygenator type on the prevalence and extent of microembolic retinal ischemia during cardiopulmonary bypass. Assessment by digital image analysis. J Thorac Cardiovasc Surg. 1990 Jan. 99(1):61-9. [Medline]. Brown GC. Arterial obstruction disease and the eye. Int Ophthalmol Clin North Am. 1990. 3:373-92. Brown GC, Magargal L, Augsburger JJ, Shields JA. Preretinal arterial loops and retinal arterial occlusion. Am J Ophthalmol. 1979 May. 87(5):646-51. [Medline]. Brown GC, Magargal LE, Shields JA, Goldberg RE, Walsh PN. Retinal arterial obstruction in children and young adults. Ophthalmology. 1981 Jan. 88(1):18-25. [Medline]. Brown GC, Magargal LE, Simeone FA, Goldberg RE, Federman JL, Benson WE. Arterial obstruction and ocular neovascularization. Ophthalmology. 1982 Feb. 89(2):139-46. [Medline]. Brown GC, Reber R. An unusual presentation of branch retinal artery obstruction in association with ocular neovascularization. Can J Ophthalmol. 1986 Apr. 21(3):103-6. [Medline]. Brown GC, Shields JA. Cilioretinal arteries and retinal arterial occlusion. Arch Ophthalmol. 1979 Jan. 97(1):84-92. [Medline]. Dhar-Munshi S, Ayliffe WH, Jayne D. Branch retinal arteriolar occlusion associated with familial factor V Leiden polymorphism and positive rheumatoid factor. Arch Ophthalmol. 1999 Jul. 117(7):971-3. [Medline]. Dori D, Beiran I, Gelfand Y, Lanir N, Scharf J, Miller B, et al. Multiple retinal arteriolar occlusions associated with coexisting primary antiphospholipid syndrome and factor V Leiden mutation. Am J Ophthalmol. 2000 Jan. 129(1):106-8. [Medline]. Gass JD. Stereoscopic Atlas of Macular Diseases. 3rd ed. Mosby-Year Book; 1987. 340-60. Gold D, Feiner L, Henkind P. Retinal arterial occlusive disease in systemic lupus erythematosus. Arch Ophthalmol. 1977 Sep. 95(9):1580-5. [Medline]. Greven CM, Slusher MM, Weaver RG. Retinal arterial occlusions in young adults. Am J Ophthalmol. 1995 Dec. 120(6):776-83. [Medline]. Guyer DR. Retina-Vitreous-Macula. WB Saunders; 1999. Vol. 1.: 271-85. Hayreh SS, Kolder HE, Weingeist TA. Central retinal artery occlusion and retinal tolerance time. Ophthalmology. 1980 Jan. 87(1):75-8. [Medline]. Hayreh SS, Podhajsky P. Ocular neovascularization with retinal vascular occlusion. II. Occurrence in central and branch retinal artery occlusion. Arch Ophthalmol. 1982 Oct. 100(10):1585-96. [Medline]. Hollenhorst RW. Vascular status of patients who have cholesterol emboli in the retina. Am J Ophthalmol. 1966 May. 61(5 Pt 2):1159-65. [Medline]. Howard RS, Russell RW. Prognosis of patients with retinal embolism. J Neurol Neurosurg Psychiatry. 1987 Sep. 50(9):1142-7. [Medline]. Jacob HS, Goldstein IM, Shapiro I, Craddock PR, Hammerschmidt DE, Weissmann G. Sudden blindness in acute pancreatitis. Possible role of complement-induced retinal leukoembolization. Arch Intern Med. 1981 Jan. 141(1):134-6. [Medline]. Karjalainen K. Occlusion of the central retinal artery and retinal branch arterioles. A clinical, tonographic and fluorescein angiographic study of 175 patients. Acta Ophthalmol Suppl. 1971. 109:1-95. [Medline]. Klein R, Klein BE, Jensen SC, Moss SE, Meuer SM. Retinal emboli and stroke: the Beaver Dam Eye Study. Arch Ophthalmol. 1999 Aug. 117(8):1063-8. [Medline]. Kollarits CR, Lubow M, Hissong SL. Retinal strokes. I. Incidence of carotid atheromata. JAMA. 1972 Dec 4. 222(10):1273-5. [Medline]. Kraushar MF, Brown GC. Retinal neovascularization after branch retinal arterial obstruction. Am J Ophthalmol. 1987 Sep 15. 104(3):294-6. [Medline]. Malinowski SM, Pesin SR. Visual field loss caused by retinal vascular occlusion after vitrectomy surgery. Am J Ophthalmol. 1997 May. 123(5):707-8. [Medline]. Morgan CM, Schatz H, Vine AK, et al. Ocular complications associated with retrobulbar injections. Ophthalmology. 1988 May. 95(5):660-5. [Medline]. Penner R, Font RL. Retinal embolism from calcified vegetations of aortic valve. Spontaneous complication of rheumatic heart disease. Arch Ophthalmol. 1969 Apr. 81(4):565-8. [Medline]. Pfaffenbach DD, Hollenhorst RW. Morbidity and survivorship of patients with embolic cholesterol crystals in the ocular fundus. Am J Ophthalmol. 1973 Jan. 75(1):66-72. [Medline]. Reese LT, Shafer D. Retinal embolization from endocarditis. Ann Ophthalmol. 1978 Dec;. 10(12):1655-7. [Medline]. Ritter M, Sacu S, Deák GG, Kircher K, Sayegh RG, Pruente C, et al. In vivo identification of alteration of inner neurosensory layers in branch retinal artery occlusion. Br J Ophthalmol. 2012 Feb. 96(2):201-7. [Medline]. [Full Text]. Ros MA, Magargal LE, Uram M. Branch retinal-artery obstruction: a review of 201 eyes. Ann Ophthalmol. 1989 Mar. 21(3):103-7. [Medline]. Savino PJ, Glaser JS, Cassady J. Retinal stroke. Is the patient at risk?. Arch Ophthalmol. 1977 Jul. 95(7):1185-9. [Medline]. Schatz H, Drake M. Self-injected retinal emboli. Ophthalmology. 1979 Mar. 86(3):468-83. [Medline]. Shapiro I, Jacob HS. Leukoembolization in ocular vascular occlusion. Ann Ophthalmol. 1982 Jan. 14(1):60-2. [Medline]. Sharma S, Sharma SM, Cruess AF, Brown GC. Transthoracic echocardiography in young patients with acute retinal arterial obstruction. RECO Study Group. Retinal Emboli of Cardiac Origin Group. Can J Ophthalmol. 1997 Feb. 32(1):38-41. [Medline]. Soong HK, Newman SA, Kumar AA. Branch artery occlusion. An unusual complication of external carotid embolization. Arch Ophthalmol. 1982 Dec. 100(12):1909-11. [Medline]. Spencer WH. Ophthalmic Pathology: An Atlas and Textbook. American Academy of Ophthalmology; 1985. Vol. 2.: 655-709. Tayyanipour R, Pulido JS, Postel EA, Lipkowitz JL, Pisciotta A, Braza E. Arterial vascular occlusion associated with factor V Leiden gene mutation. Retina. 1998. 18(4):376-7. [Medline]. Vine AK, Samama MM. The role of abnormalities in the anticoagulant and fibrinolytic systems in retinal vascular occlusions. Surv Ophthalmol. 1993 Jan-Feb. 37(4):283-92. [Medline]. Wang MY, Arnold AC, Vinters HV, Glasgow BJ. Bilateral blindness and lumbosacral myelopathy associated with high-dose carmustine and cisplatin therapy. Am J Ophthalmol. 2000 Sep. 130(3):367-8. [Medline]. Whiteman DW, Rosen DA, Pinkerton RM. Retinal and choroidal microvascular embolism after intranasal corticosteroid injection. Am J Ophthalmol. Jun 1980. 89(6):851-3. [Medline]. Wilkinson WS, Morgan CM, Baruh E, Gitter KA. Retinal and choroidal vascular occlusion secondary to corticosteroid embolisation. Br J Ophthalmol. 1989 Jan. 73(1):32-4. [Medline]. Younge BR. The significance of retinal emboli. J Clin Neuroophthalmol. 1989 Sep. 9(3):190-4. [Medline]. Fluorescein angiogram of right eye with inferior branch retinal artery occlusion. Delayed filling of the artery (arrow heads) by the fluorescein is noted. Red-free photograph (before injection of fluorescein) of right eye with inferior branch retinal artery occlusion. The red-free photograph greatly accentuates the retinal whitening surrounding the occluded artery. Optical coherence tomography (OCT) of right eye with inferior branch retinal artery occlusion. Cross-section goes through inferior retina to superior retina, capturing the abnormally thickened retina associated with intracellular edema. Optical coherence tomography (OCT) over time of a branch retinal artery occlusion. Taken 24 hours after symptom onset, A shows an unaffected portion of the macula, while B shows swelling of the inner retina in the area affected by the branch retinal artery occlusion (BRAO). Two weeks later, this swelling/increased thickness is beginning to resolve (C). Two months later, the inner retina has thinned notably, and the inner plexiform layer, inner nuclear layer, and outer plexiform layer are difficult to distinguish from one another. Courtesy of British Journal of Ophthalmology. 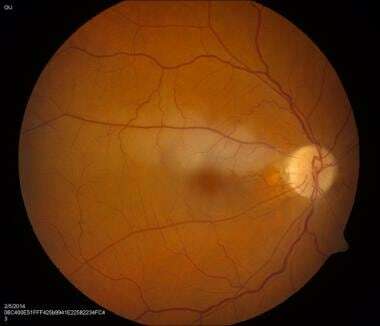 Color fundus photo of left eye with branch retinal artery occlusion caused by embolization of ethylene vinyl alcohol copolymer (Onyx), a liquid embolic agent used in the treatment of saccular aneurysms, into the retinal circulation. Courtesy of Vanderbilt Eye Institute.